Each time you make a reservation through this website, your reservation is made directly with Ostria Studios. As such, you are guaranteed the lowest possible rate, unlike reservations made through third party systems (whose prices include the given platform’s commission). To send a reservation enquiry directly to Ostria Studios click here! 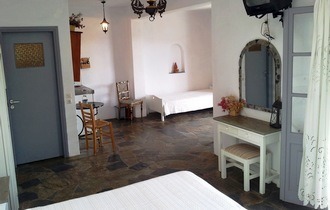 "Ostria studios and apartments" is located at the start of the beautiful beach of Platys Gialos, one of the longest beaches on Sifnos island. It is built in the island's traditional architectural style, in lush green surroundings with a unique sea view. 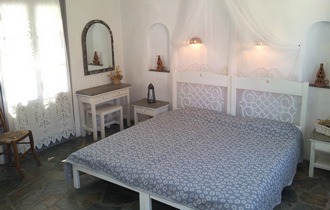 It offers its guests one-room (2-4 persons) and two-room apartments (4-6 persons) with all modern amenities. The accommodation features A/C, wireless Internet, kitchenette, large verandas, parking, WC, breakfast. Here you will find an island atmosphere combined with perfect service.